Ariana Grande-Butera (/ˌɑːriˈɑːnə ˈɡrɑːndeɪ/; born June 26, 1993) is an American singer, songwriter and actress. 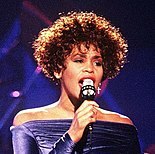 As one of the world's leading contemporary recording artists, she is known for her wide vocal range and has received such accolades including one Grammy Award, one Brit Award and three American Music Awards. Grande's second studio album, My Everything (2014), continued the pop-R&B sound of its predecessor and incorporated EDM into a few tracks. It topped the Billboard 200 and featured four US top-ten singles—"Problem", "Break Free", "Bang Bang", and "Love Me Harder". Grande's pop-R&B styles extended on her third studio album, Dangerous Woman (2016), which was her first number-one album in the UK. For her next two studio releases, Sweetener (2018) and Thank U, Next (2019), Grande experimented with trap while maintaining her characteristic pop-R&B tones. The former won a Grammy Award for Best Pop Vocal Album, and the latter earned a record for the highest-streaming opening week. Grande became the first solo artist to hold the top three spots on the Billboard Hot 100 simultaneously when "Thank U, Next" , "7 Rings", and "Break Up with Your Girlfriend, I'm Bored" did so in 2019. She is also the first act to have the lead singles from each of their first five studio albums debut within the top ten in the US. An influential figure on social media, Grande is an outspoken feminist and supporter for LGBT rights. She asserts control over her public image and is known for her iconic ponytail hairdo and bold fashion statements. In February 2019, she became the most followed woman on Instagram. Time named Grande as one of the 100 most influential people in the world twice (2016 and 2019), and Billboard recognized her as the "Woman of the Year" in 2018.